Murder at 3¢ a Day is the first and only reference volume devoted entirely to the lending-library publishers that flourished from the mid 1930s into the 1960s. More than ten years in compilation, it contains full listings of mystery and detective fiction published under such imprints as Phoenix Press, Hillman-Curl, Mystery House, Gateway, Arcadia House, Dodge, and Caslon. Included are dust jacket blurbs, settings, and leading characters for each title, as well as descriptions of jacket illustrations and names of the artists who designed them. Also included: an article about the lending-library trade written in 1939 by Charles S. Strong, who specialized in this type of novel; a tongue-in-cheek article on Phoenix Press mysteries by Bill Pronzini; brief biographies of many lending library writers; and selected period newspaper reviews of various titles. Readers and aficionados alike will find a wealth of fascinating and often amusing information about this little known variety of crime fiction. Murder at 3¢ a Day is a must for any reference shelf. William F. Deeck (1936-2004) was a well-known mystery fan and collector who had a special affinity for lending-library fiction. In addition to the present volume, he was the author of numerous articles and reviews for The Armchair Detective, Mystery Readers Journal, and other publications. What you hold in your hands is a labor of love. There have been scores of biographical and bibliographical reference works devoted to quality mystery fiction, but only a couple – Gun in Cheek (1982) and Son of Gun in Cheek (1987), both written by yours truly – that pay tribute to the genre’s lesser lights. And until the present volume, there has been no detailed source of information on the hundreds of mysteries published by, and the writers who wrote primarily or exclusively for, the lending-library markets that flourished in the 30s, 40s, 50s, and lasted well into the 60s. 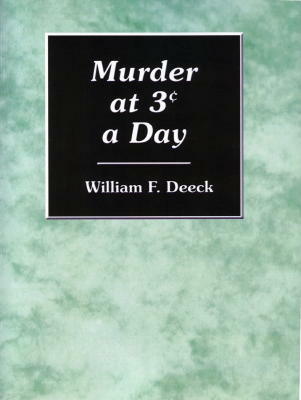 Murder at 3¢ a Day was conceived by Ellen Nehr, as a similar volume to her Doubleday Crime Club Compendium (1992), with Bill Deeck acting as assistant. A relatively small amount of material had been gathered when Ellen died late in 1995; it was Bill, with help from various other collectors and aficionados, who did most of the work of researching, compiling, and annotating the entries and who therefore earned the solo byline. After Bill’s death in 2004, I inherited the project – the adding of new material when found and the search for a publisher. Others deserving of heartfelt thanks for their efforts include Allen J. Hubin, Steve Lewis, Richard Moore, and Mark Terry. Any reader and collector of crime fiction, whether or not a fan of the odd, obscure, and delightfully absurd (Bill’s original title for the volume was Mostly Awful), will find much to entertain and enlighten them here. Some who were previously inclined to scoff at “alternative” mysteries might well join the growing number of us who consider them irresistible. For you, Bill, and Ellen too, with gratitude. I wish you were both here to see it published. Copyright © 2006 , 2007, 2008 by the Pronzini-Muller Family Trust on behalf of William F. Deeck.